5/8 Cup of Coffee: It was a winless Sunday for the Red Sox affiliates, with the PawSox losing a pitching duel while the other teams were on the wrong end of high-scoring games. Sam Travis's double provided the only run in Pawtucket. The Portland bullpen blew a huge lead and a solid performance by starting pitcher Trey Ball. 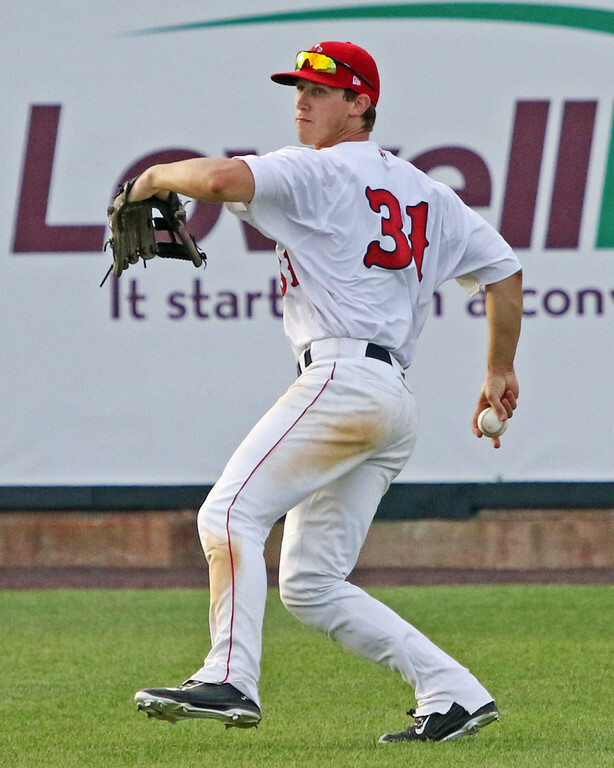 Michael Chavis, Trenton Kemp, Ryan Scott (pictured), and Chris Madera had strong days at the plate in the low minors. The PawSox picked up a run in the first inning on an RBI double by Sam Travis but that was all they could muster in a weak performance by the lineup. Steve Selsky, who came in to score on that double, went 2 for 4 with a double and was the only PawSox player to record multiple hits. Shawn Haviland made a quality start, allowing three runs in six innings with six strikeouts and a walk. Southpaws Edgar Olmos and Robbie Ross Jr. each threw a shutout inning. The Sea Dogs grabbed a commanding lead with an eight-run third inning but were unable to hold on due to a poor performance by the bullpen. Trey Ball made a solid start, tossing six innings and allowing three runs (one earned). Luis Ysla took the loss after allowing six runs in 2/3 of an inning and Josh Smith gave up four runs (three earned) in two innings. Rafael Devers was 1 for 4 with an RBI and a run. Josh Tobias was 1 for 4 with two RBIs, a run, and a walk. Roenis Elias, pitching in Salem on a rehab assignment, was rocked for nine runs (seven earned) in four innings. Dedgar Jimenez pitched well out of the bullpen, though, throwing five innings with only two runs (one earned) and five strikeouts. Michael Chavis smacked a three-run homer, his seventh of the season, as part of a 2-for-5 game. Trenton Kemp was 2 for 3 with a double, a triple, and two walks. Jose Sermo was 2 for 5 with a double and three RBIs. Josh Ockimey went 1 for 4 with a walk and a run. Starting pitcher Logan Boyd struggled with five earned runs on seven hits in four innings and took the loss as Greenville was unable to rebound from an early deficit. In relief, Algenis Martinez allowed two runs in three innings and Matthew Gorst threw two scoreless frames. Ryan Scott had a huge day at the plate, going 3 for 4 with a double, home run, walk, and three runs scored. Chris Madera also reached base four times, going 2 for 3 with a double, two walks, two runs, and an RBI. Bobby Dalbec was 1 for 4 with a walk and three strikeouts. Player of the Day: It wasn't quite enough for the win but Ryan Scott almost brought the Drive to victory with a big game. Scott knocked a solo home run in the fourth inning as part of a 3-for-4 game in which he also doubled, walked, and scored three times. The Red Sox drafted Scott in the seventh round of the 2016 draft and he's off to a .237/.317/.452 start in his first taste of full-season ball.